Before the big Easter Egg Hunt event, one needs to mail out those invitations and cards. Hosting this event for the children will be fun. 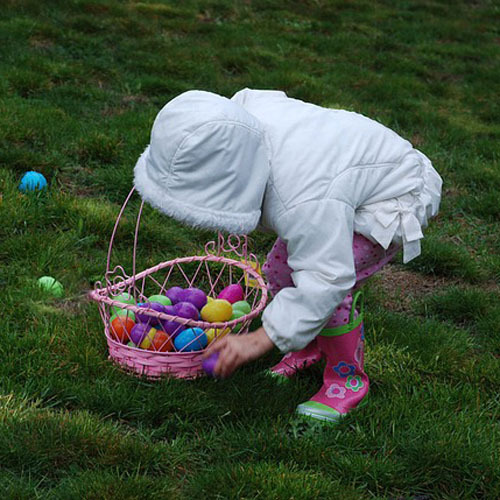 As a child, I recall finding those colorful eggs filled with candy that is hidden in the grass and more challenging places. Real hard boiled decorative eggs would be part of the game as well. It would be a contest to see who could fill up their baskets the fastest. Easter Sunday can be the special day for a family gathering. Begin the day with the children and adults searching for holiday candy. Later on, celebrate with the festive Easter brunch or dinner. The invitations and tote bags on Zazzle are customizable to change the wording and look to fit your special day together. (Note: Colored text are links to Zazzle stores and Amazon which I am an affiliate). Festive games are often a part of the church or citywide celebrations. These are also for family and friend holiday parties. Good to begin with the right card. Baskets work nicely to gather the eggs during the Easter egg hunt. As shown with the little girl in the photo above. However, where does the basket go after the holiday is over? A fabric tote bag will have many uses long after the special day is over. No need to toss it down into the cold damp basement as you would do with an Easter basket. A tote bag for the Easter egg hunt makes perfect sense. It is bigger than a basket and can hold much more treats. Take home that stuff bunny toy, Peter Cottontail book and eggs from the hunt. I know personally how sturdy these bags are at Zazzle. Send out some vintage image Easter greeting cards, modern and funny cards. Share these with friends and family. Mail them in with the matching stamps. At the family brunch, everyone on your list should have a personalized quality card like the ones below. All these are templates and customizable. You can resize, tile or exchange the images for your own. Add your own greeting. See all Sandyspider Stores at Zazzle and check out the special sales and promo codes at the top of the site. For those who still insist on the Easter basket , below is a set of four. More accessories would be the plastic eggs and candy. A gift a child would enjoy would be a plush bunny , classic book and candy .